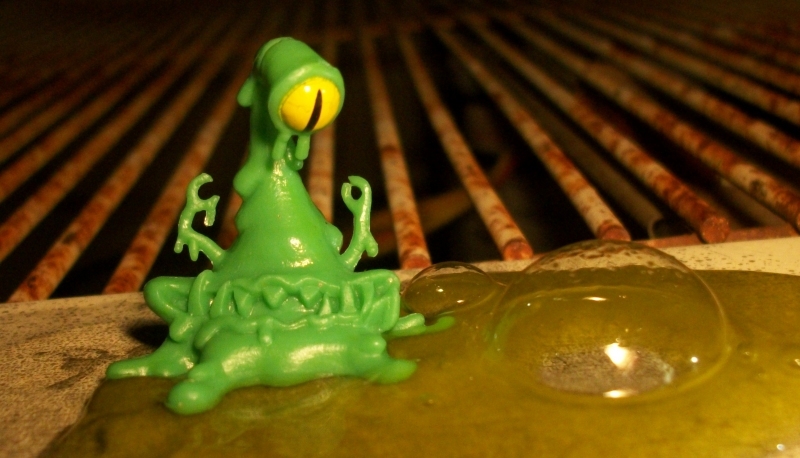 Continuing our look at the wonderful characters of Slimy Sludge, currently available only at Target! 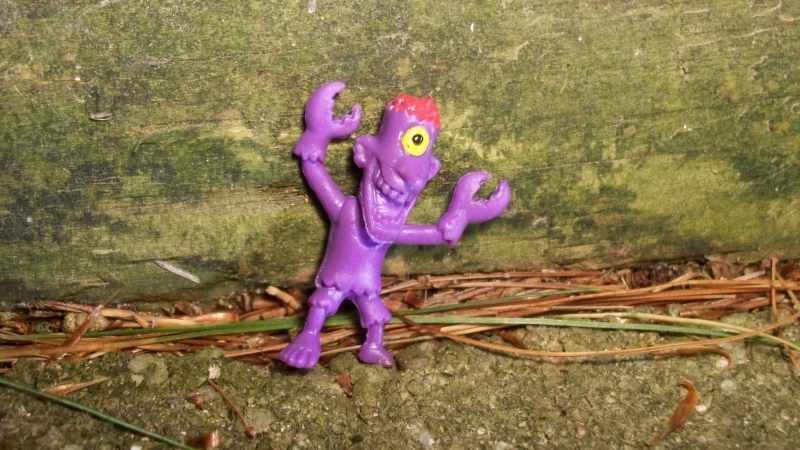 Johnny Lobster is the very last figure I managed to get my hands on, and I actually found two of him on the same trip. He's easy to feel through the package, since he's the lightest and skinniest of the zombies. 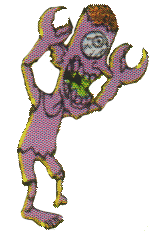 This one-eyed, one-legged weirdo looks like he'd be almost as berserk as Toxic Tom, but while Tom feels like a "rampaging brute," Johnny comes across as more of a "sadistic fiend," the kind of monster who can barely get a word out between his own incessant giggling fits. He hops and he giggles. Hops and giggles and snips people open with his mutant pincers, happily bouncing away with their intestines like a child with party streamers. It's a good thing that's little more than a mild annoyance to the company he keeps. 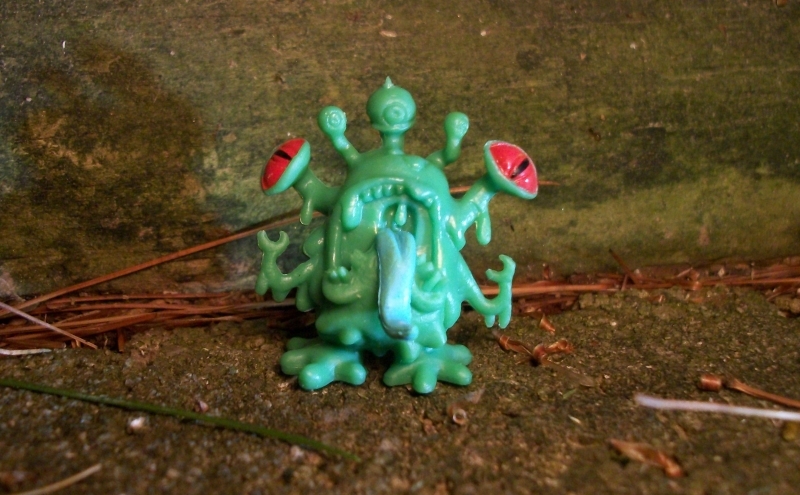 This guy isn't terribly remarkable compared to the weirdness of many other sludgies, but it's a good day when you can say one of the "generic" members of a set has five stalked eyeballs in three different varieties and appears to be screaming all the time. That's why his name is Crazy Slimersons! 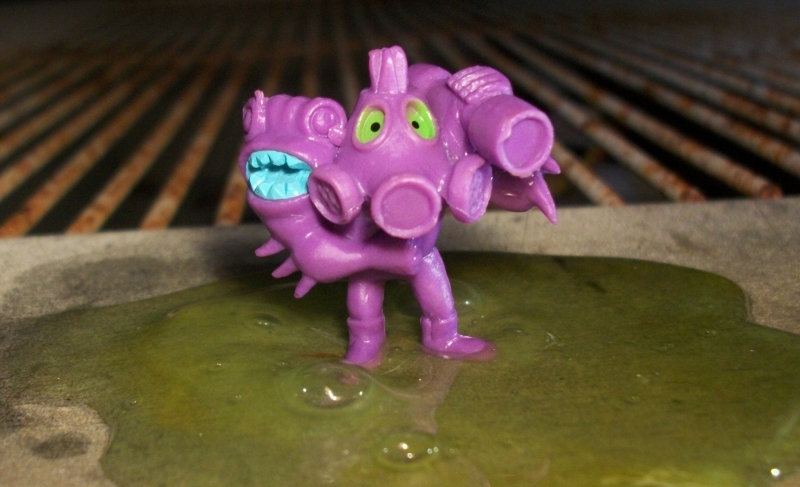 I feel like this guy would be the comic relief of the gunkbeasts, always shrieking some well-timed non sequitor or another. "Sliiiiiimersoooooons!" moan his friends, shaking their heads and putting their pseudopodia somewhere on their respective hip-like regions. It's affectionate exasperation, of course. Deep down, they don't know what they would do with Crazy Slimersons Crazy Slimersonisms to brighten their otherwise bleak existence between human raiding parties. Like Slimeyeti, I really underestimated Zooka at first glance. 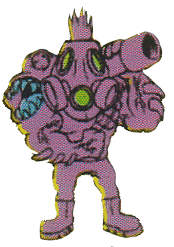 From the artwork, he looks like the most "human," most underwhelmingly ordinary Rot Zombie, but in figure form, he manages to have a whole lot more character to his gas-masked face, more extreme proportions, and the monster face growing out of his shoulder is a whole lot more evident. I'm kind of torn between pretending his shoulder-face has its own personality, or pretending his real brain is in there, and nothing is under the gas mask but a clot of tissue with a spare set of eyes. Still one of the most human-shaped of his team, I feel like Zooka would be kind of their everyman; kind of the main muscle. Not as strong as Toxic Tom, but a whole lot more dependable, capable of actually carrying out orders and holding a conversation instead of just breaking and throwing things. Everyone who sees Slobber seems to be reminded of Futurama. 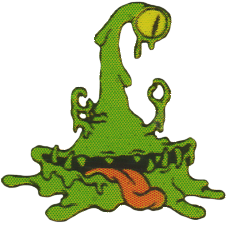 He really does look like Matt Groening's various gooey, green mutants, seen not only in Mr. Horrible Gelatinous Blob or the Brain Slugs but in some early Simpsons material too. What Slobber really makes me think of, though, is the Dionaga from Star Wars, known to laymen as "that trash compactor monster." I really like the wideness of Slobber's mouth and long, interlocking teeth, like a Venus fly-trap, and the little arms emerging from above the mouth is a cute little touch, making the "eye stalk" feel almost more like a "torso," with the mouth sort of in the "stomach" region. 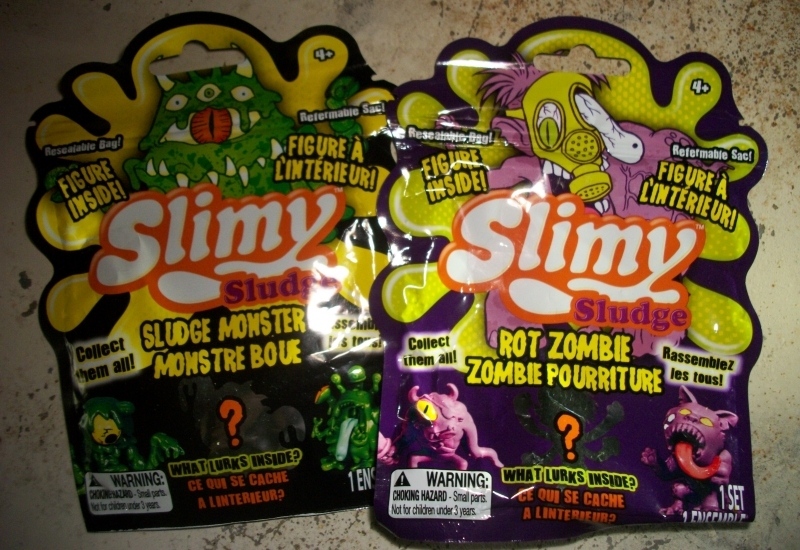 Don't ask me why, but I feel like Slobber is the smartest looking Sludge Monster. I look at him and I see a scientist or a doctor whose consciousness re-emerged in the parasitic, mutagenic fungoid slime of the apocalypse, and possibly went on to build Slimebot so he'd have a reliable assistant. 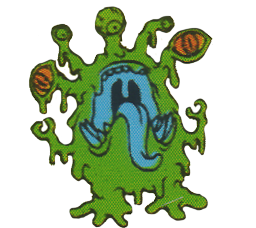 Fortunately for his line of work, nothing can befall a Sludge Monster that can't be fixed with the addition of more slime.